I love having a picky eater and making more than one meal at dinner... said no mother ever. Most parent's have struggled with a picky eater; it almost comes with the territory of having children. We all just want our children to be nourished, for them to feel grow up healthy and strong. As parents we worry that when they aren't eating a varied diet, they are lacking vital nutrients. Amanda and Melanie have come up with their top 13 strategies to help parents curb picky eating and to get them to try new foods. Having both had experience working with children in the education system as well as experiencing picky eaters of their own, they have learned what works and what doesn't. This workshop is to arm parents with strategies to take home and start the next day. 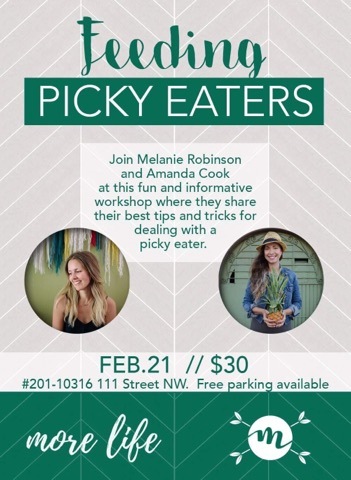 Come, learn, and taste some delicious alternatives to kids favourites. I am a Certified Holistic Nutrition Consultant, lover of food, photographer,and head chef for my amazing husband and two daughters. I want you to be inspired to make simple, delicious, and beautiful looking food for your family, right in your own kitchen. I am determined to teach families about how using whole foods to nourish their bodies can change their life. Amanda is holistic nutritionist, a busy mama of two and who is passionate about healthy eating that is gluten, dairy and sugar free. Although self taught, she is a wiz when it comes to knowing her way around a kitchen and figuring out how to make life easier. Amanda loves sharing how to simplify healthy eating and how to have a balanced diet using clean ingredients, nothing fancy or complicated. She believes that health and simplicity should definitely co-exist.